So Mr. Hawley was raised by a criminal, who is also a monster. Permalink: So Mr. Hawley was raised by a criminal, who is also a monster. It appears we've seen the last of Mr. Hawley this season. Didn't you feel that as he said his goodbyes on Sleepy Hollow Season 2 Episode 14 to chase after Carmilla? Hawley was a polarizing character among fans. Did you like the guy? TV Fanatics Jim Garner, Stacy Glanzman, Whitney Evans and Hank Otero discuss Mr. Hawley and his step-monster, our favorite scene and plenty more. Please share your thoughts with us in the comments section, we love hearing from you! Name your favorite scene this week. Was it karaoke, Crane's Mustang ride, the vault? Jim: I really like Hawley and Jennie at the end. It was sweet to see that he truly cares for her (and the rest of the Scooby gang). I think his departure is as much to do with figuring out how to process that as it has to do with hunting Carmella. Stacy: Hard to pick against watching Ichabod do karaoke. What a better way for he and Abbie to bury the hatchet than with mutual embarrassment? Totally trumped Ichabod does yoga for me. 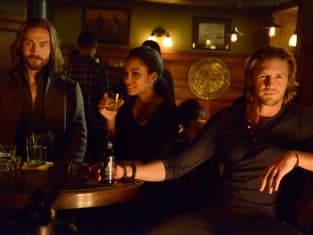 Whitney: I liked the vault lock down and the conversation between Ichabod and Abbie. It felt like the writers were acknowledging what we've been saying about the distance between them. The karaoke duet is a close second, as it felt more like the Ichabbie we've come to know. Hank: I'm with Whitney, absolutely loved everything about the Knox vault lockdown. That sequence brought back memories of Indiana Jones and Star Wars (which even Abbie mentioned). Didn't care much for Crane's solo karaoke, but the duet with Abbie worked. Stop splitting them apart writers! Jim: As much as I abhor the overt (and pre-announced) product placement of the Ford Mustang, it had my favorite line from Ichabod, as he pointed out the differences in horses and Jennie saying "whichever is fastest". Stacy: I'm sticking with karaoke and Ichabod's song choice. I liked Abbie's comment that the talent was there but his selection could use some work. Whitney: I have to agree with Jim here, the Mustang and horses comment was really funny. I also love that Ichabod will never be a fan of yoga. Hank: I loved when Abbie and Crane were trapped in the vault talking about failure of communication, and he says... "The roster of our missteps is growing to karaoke catalog-sized proportions." What did you think of Hawley's childhood caregiver, Carmilla? Was the Vitala scary? Jim: Talk about a step-monster! Ok, so she wasn't really his step-mother, just his foster parent in his teen years, but still. I adore Jamie Murray, so I'm glad she got away, I hope she gets to make a return visit, I thought she fit in nicely. Stacy: I liked the story line with Hawley this week. The Vitala wasn't my favorite monster of the season but I thought she was interesting. Whitney: Well, wasn't she just awful! I've been a Hawley supporter for the most part, so I was looking forward to this Hawley-centric episode and it didn't disappoint me. If I'm ranking all the monsters this season, she's probably somewhere in the middle. Hank: Haha nice one Jim! I'm also a huge fan of Jamie Murray, so I loved seeing her on the show. I think the writers could have given her a better role. I agree with Stacy, the Vitala wasn't my favorite monster; not scary at all. Is Nick Hawley gone for good? If so, will you miss the character? Jim: I don't think he's gone for good. At least, I hope not... he was a good source of arcane knowledge, banter, and romantic interest for Jennie. Stacy: I doubt it. He's always been a supporting character who didn't need to be in every episode, so I imagine he'll be back once he's accomplished his task. I would miss him if he was gone for good. He's really grown on me and that wasn't a good enough send off for him. Whitney: It kind of felt like he was written off. They definitely left the door open for him to return, but it felt like he served his purpose and the show was ready to part ways. I'll personally miss Hawley. I liked the antagonistic relationship he shared with Ichabod and I couldn't help but smile at that goodbye kiss he laid on Jenny. I hope we see him again! Hank: I cheated and checked IMDB. Matt Barr isn't listed in any more episodes this season. Regardless, they certainly left his storyline open for a return. A 3 or 4 episode arc for Hawley would have been fine, but Barr was in 9 of the 18 episodes. The writers attempted to force him on us, sacrificing other characters in the process. He started to bug me early on. Katrina determined that Captain Irving is free of Henry. How is it he returned from the dead? Why no reflection? Jim: Let me start by calling Shenanigans on the "no reflection". He sat in the interrogation room for hours looking at his reflection in the one way mirror, so to suddenly not have a reflection just as he feels safe was _way_ too coincidental, even for this show. Second, I'm hoping that he is a champion of good or something sent back to be a holy avenger. It would make for a nice change from the "Everyone I've ever known comes back as a monster". Stacy: I really don't know what to make of it. I'm still not convinced he's not a third horseman and our heroes still need to be wary of him, but I do hope he's still a good guy. Whitney: Katrina was giving off some weird vibes towards the end and it made me wonder if she was telling the truth. I'm very intrigued by this storyline but I have absolutely no idea where it's headed. I initially thought, is he a vampire or something? Hank: Like Jim, I remembered Irving's reflection in the interrogation room. I went back to Abbie's visit with Irving in last weeks episode and he definitely appears in the one way mirror. Are the creators not paying attention to these details? Or is it something else. Like Whitney I caught a weird vibe from Katrina. Could a trace of Moloch have stayed with her? Is she our next horseman? 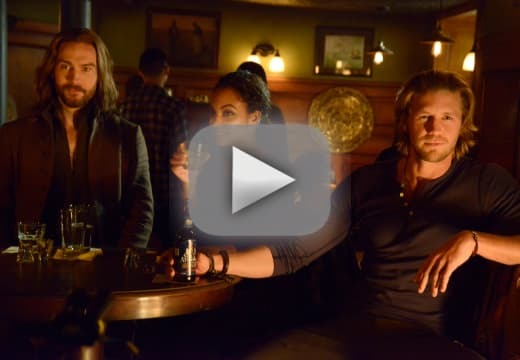 Next week's Sleepy Hollow Season 2 Episode 15 is titled "Spellcaster" and airs February 2 at 9/8c. Carmella: The job's here in Sleepy Hollow. We're gonna rob Theodore Knox's estate. Hawley: Knox? You mean like Fort Knox? Carmella: What I've gotten myself into; my life's on the line now. Hawley: No sorry it's too weird and out of the blue. Carmella: That's the way life is. You owe me Nicky. Time to repay your debt. Permalink: That's the way life is. You owe me Nicky. Time to repay your debt. Ichabod: The lieutenant and I made our peace. Jenny: Okay good. It just seems you two have been spending a lot less time together lately. Permalink: Okay good. It just seems you two have been spending a lot less time together lately.